Springfield (MA) December 21, 2018—It is with great sadness that the Springfield Museums share the news that Audrey Geisel, widow of Theodor Seuss Geisel, has passed away. Audrey was renowned as a champion of her late husband’s work and as a generous philanthropist. That generosity has had a deep and lasting impact on the Springfield Museums. Following Geisel’s death in 1991, his wife, Audrey Geisel, authorized the Museums to create the Dr. Seuss National Memorial Sculpture Garden at the Springfield Museums. The Sculpture Garden celebrates Theodor Seuss Geisel, aka Dr. Seuss, in the city in which he was born. More than four million people have visited the attraction since it opened in 2002. 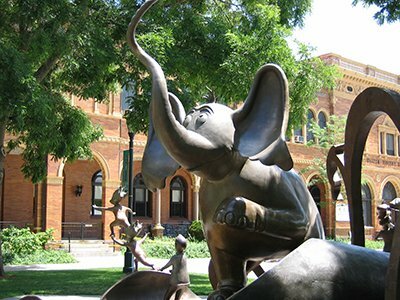 The Sculpture Garden—and its many visitors—inspired the creation of The Amazing World of Dr. Seuss Museum, said Springfield Museums President & CEO Kay Simpson. Audrey Geisel had a special relationship with Springfield, Massachusetts. Not long after her marriage to Ted Geisel in 1968, Audrey and Ted flew to Springfield to visit Ted’s father and oversee his move to a nursing home. It was her first visit to the city that had nurtured the creative genius of the man she had so recently married. Close to twenty years later, Audrey and Ted returned to Springfield in 1986 to see an exhibition of his work that had been mounted at the George Walter Vincent Smith Art Museum. The exhibition included sketches and drawings from 14 of his books, including And to Think That I Saw It on Mulberry Street, which is based on a real street in Springfield. The Springfield City Schools had launched “Seussamania,” a three month program in reading and creative writing and Ted promised to appear as part of the festivities. Ted and Audrey walked down Mulberry Street and Mayor Richard E. Neal (now Congressman Neal) took them a tour through Forest Park, where Ted’s father had been the long-time Superintendent. Mayor Neal also presented Ted with a special memento: a weathered sign, GEISEL GROVE, which children had found high in a tree near the Forest Park picnic grove frequented by the family in Ted’s youth and named in his honor. The sign now hangs in a gallery on the second floor of The Amazing World of Dr. Seuss Museum. During the visit, two hundred pupils, gathered with teachers and parents, shouted their welcome as he stepped from the bus: “We love you, Dr. Seuss!” Proudly holding up a banner that read, AND TO THINK THAT I SAW HIM ON MULBERRY STREET!, the children thronged around him reciting lines from Green Eggs and Ham. Ted was very moved and wiped away tears as he stepped onto a bus that took him to his childhood home at 74 Fairfield Street, which is now owned by the Springfield Museums. Once inside the house, Ted took Audrey in his old bedroom and showed her the area of the wall where he gouged the plaster with his pencil. In his sister’s room, he showed the current residents where he had drawn murals of “crazy animals.” The visit was profoundly moving and memorable for Audrey and Ted. During that time of Dr. Seuss birthday celebrations in 1986, David Starr, then chair of the Springfield Museums, sat next to Ted Geisel at a dinner and a struck up a friendship. Later, David Starr proposed that a sculpture garden be created in Ted’s memory on the grounds of the Springfield Museums. Although Geisel initially demurred, Starr prevailed over time and Ted agreed to help with this venture. An economic downturn delayed the project and Ted died before the project was re-started. Audrey took up the cause together with then Springfield Museums’ President Joe Carvalho. Audrey Geisel stepped forward with a million dollar donation to jumpstart the fundraising campaign. Lark Grey Dimond-Cates, Audrey’s daughter, was chosen from among 35 other sculptors for her talent and for her ability to stay true to the spirit of Dr. Seuss’s original work. On May 31, 2002, six and a half years later, the Sculpture Garden opened to tremendous fanfare with Audrey, Lark, and many family members in attendance. Fifteen years later The Amazing World of Dr. Seuss opened its doors. Audrey’s daughters—Lark Grey Dimond-Cates and Leagrey Dimond—stepped forward to donate many of Ted’s personal items, including his drawing desk and chair, original art work and rare memorabilia to the Museum, making it truly unique and a destination of great importance to Dr. Seuss fans the world over. Since the Museum opened the Springfield Museums have doubled attendance and has generated a more than $16,000,000 impact on the City of Springfield.